My business partner has a penchant for large mirrors ( and I am not saying that I don't !) 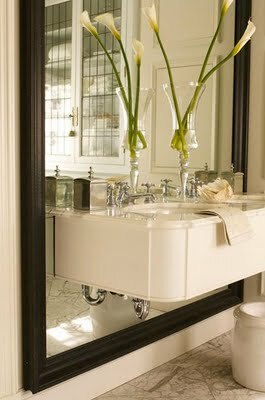 so we frequently include oversized mirrors in our designs for clients, on the floor and occasionally behind console tables. We have not yet done this look which I love. Obviously you would only do it if you had lovely shiny under sink plumbing (no plastic) and I am assuming the mirror is in two pieces with the lower part cut around the vanity. I don't know, it could be once piece that is predrilled by the glazier ? . . .